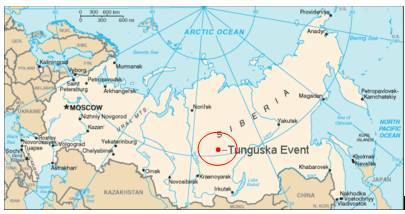 Tunguska – Connected to Global Warming? The following figure shows the global average temperature from 1850 – 2008 [http://hadobs.metoffice.com/hadcrut3/diagnostics/global/nh+sh/], from Hadley data as used by the IPCC. 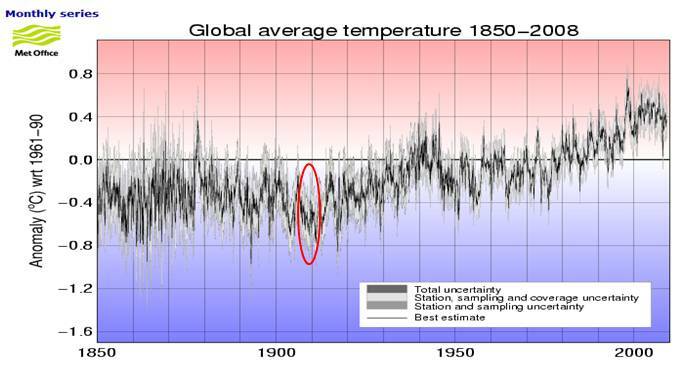 The year 1908 marks the turning point for the start of the 20th century warming. The following sequence of figures shows the change of the magnetic field intensity over the last 200 years [http://swdcwww.kugi.kyoto-u.ac.jp/igrf/anime/index.html], along with the North Magnetic Pole (NMP) movement map [http://gsc.nrcan.gc.ca/geomag/nmp/long_mvt_nmp_e.php]. Around 1900 the NMP reversed direction and started accelerating north towards the Arctic. This coincides with an increase in the magnetic field intensity in northern Siberia, and the subsequent development of two north magnetic intensities. In 1800 there was a single north magnetic intensity over northern Canada; by early 1900s the Siberian intensity was growing; by 2000 the Siberian intensity was the stronger of the two. 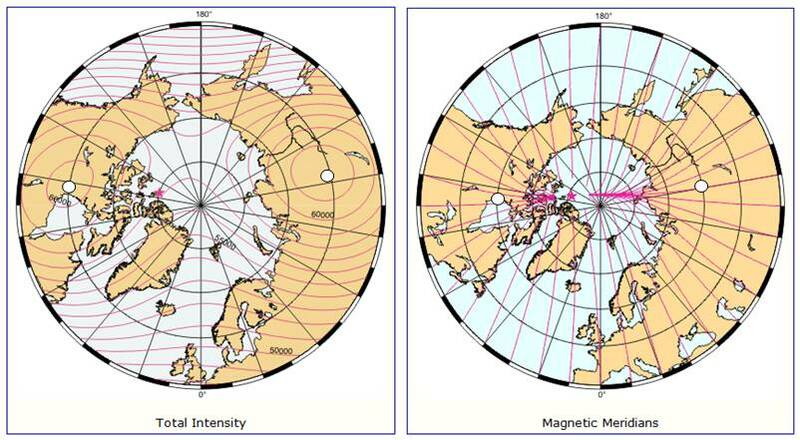 The location of the center of the Siberian magnetic flux intensity is the same location as the Tunguska event. The following figures show the magnetic field intensity (left) and the magnetic meridians (right) in 2000 [http://gsc.nrcan.gc.ca/geomag/field/arctics_e.php]. The magnetic field is asymmetrical – with two field maxima: one over the northwest shore of Hudson Bay in Canada, and one over the Central Siberian Plateau. The convergences of the magnetic meridians indicate the approximate path followed by the moving NMP. The NMP is marked by the magenta star just entering the Arctic Ocean area north of the Canadian archipelago as it heads along the line of magnetic meridian convergence towards Siberia. “Back and forth between northern Canada and Siberia”. It would seem the Tunguska event was rather a symptom, not a cause – an incoming iron/nickel meteorite, perhaps had an electric charge making it susceptible to the Earth’s magnetic field orientation and headed towards the strongest north polarity magnetic intensity. Or perhaps, just a coincidence.